Company Owned and run by Bishwokarmas or Metal Smith-�KAMI� (Born to Khukuri Makers). Nepalese Khukuri House is the finest and largest Khukuri maker in Nepal since 18 yrs. Probably, Nepal's first online Khukuri seller by processing secure credit or Debit cards . 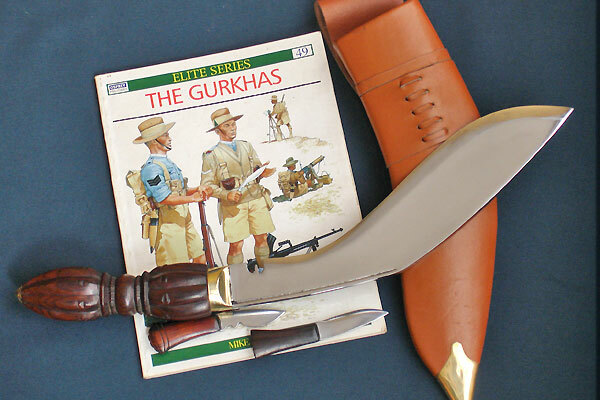 Official Khukuri supplier to Gurkha unit in Kathmandu, Royal Nepalese Army and Nepal Police. We are the GENUINE kukri Exporter since 1999. Product Description :: This work of fiction kukri that looks more similar to a significant kukri because of its form is a new product of kukri by gurkhakukri.com. The Khukuri-gurkha knife has a new wooden made VAJRA (Thunder Bolt-Shaped) handle and with a new Military red Craftsman made leather. The Bajra khukuri symbolizes the wisdom of emptiness. VAJRA is sign of Lord King INDRA (KING OF HEAVEN). Vajra originally refers to the thunderbolt weapon wielded by INDRA. It has 17� blade along with 6� BAJRA handle. The handle is made of Indian rosewood. The blade is not steel, it is carbon steel. It has two pockets on the back of the scabbard which hold a blunt steel called "chakmak" for sharpening the blade or for striking spark from flint and a little knife known as "karda" used for skinning small animals such as rabbits. The total weight of this item will be 2 Kg with packing. Copyright � 2001-2013 Nepalese Khukuri House (P) Ltd. All rights reserved.